For the village in Burkina Faso, see Neiba, Burkina Faso. 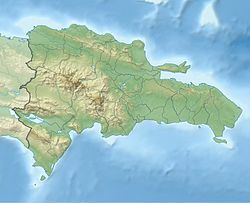 Neiba (also spelt Neyba) is a city in the southwest of the Dominican Republic. It is the capital city of the Baoruco province, and is located 180 kilometres west of the national capital, Santo Domingo, close to the shore of Lake Enriquillo, the largest lake in the West Indies. During the 1822–44 Haitian occupation, the city was officially designated in French as Neybe. ^ "Neyba Climate Normals 1961-1990". National Oceanic and Atmospheric Administration. Retrieved September 18, 2016. This page was last edited on 22 October 2018, at 00:57 (UTC).